Place all ingredients in the slow cooker. Give it a quick stir. Cover and cook on low for about 5 hours or until the pork is completely cooked through. Slice thinly then return to the slow cooker on high for 10 minutes before serving. 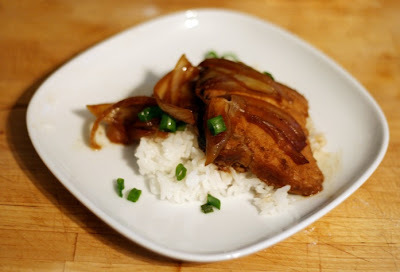 Serve over white rice garnished with chopped scallions. *I have been using Wan Ja Shan sauces to great success. They are easy to find and have a tasty, authentic flavor. They even have organic soy sauces! This my interpretation of a take-out favorite, Mongolian Pork. I think Mongolian Beef might be a bit more common but one of our favorite Chinese take-out places has a yummy Mongolian pork. Mongolian pork (or beef or chicken) isn't strictly authentic Chinese food, it is one of these Chinese-American take-out concoctions. Generally a rather saucy vegetable-deficient meat dish it is salty-sweet and wonderfully addictive. I think the pork is a little lighter tasting than beef and making it in the slow cooker is a breeze. If you pop some rice in the rice cooker as I did, the whole meal takes maybe 5 minutes of hands on time. Faster than actual take-out!